As the dean of the Graduate School of Arts and Sciences and the College of the Arts and Sciences of the University of Tokyo, I would like to welcome, with the greatest enthusiasm, each one of you who has just joined our Komaba community. From today onwards, Komaba will be your home. Home is a place where its members share a dream of and a commitment to a brighter common future. By welcoming you to our community as your home, I mean to invite you to take part in our efforts to resolve issues which earlier generations have been hard pressed to address. It is my view that those challenging goals of global relevance include thinking through and figuring out ways to realize multicultural peaceful coexistence in a diverse society and sustainable development of human societies across the globe. No doubt, this course of events has been deeply troubling. But pessimism and cynicism should not be our option. Instead, I would like you to stay positive and to be brave optimists in search of a way out. This brave optimism should not be uninformed wishfulness but educated judgment. It is in this context that our PEAK/GPEAK programs come into the picture. This diverse and multilingual group of admitted students like you are united through your shared commitment to a brighter common future and associated concern about present problems of universal relevance, such as peaceful coexistence and sustainable development in the world. Those hopes about the future and concerns about the present are closely related to each other in that there is no vision of the future without revision of the present. To realize the brighter future, one must look back and reconsider what has brought about the present problems. 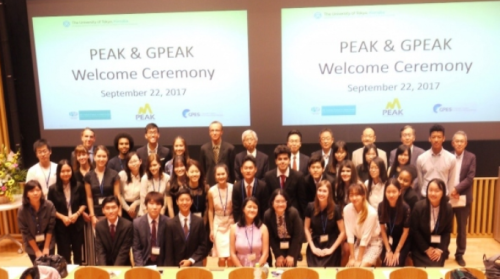 Our PEAK/GPEAK programs offer what you need to tackle these problems: first, an integrated understanding of the world’s complex reality with full awareness of competing and complementing academic viewpoints, in other words, an interdisciplinary mindset; second, logically consistent reasoning and evidence-based analytical methods that equip you with real scientific persuasiveness; third, the multicultural unbiased imagination necessary to comprehend fully the many problems facing human societies across the globe; and finally, the global communication abilities that are indispensable when articulating your own original ideas about universal problems.